The Committee on World Food Security (CFS) and GFAR are joining forces again this year to ramp up the online presence and social media outreach of the landmark CFS annual event—this time in its 44th session (FAO Headquarters, Rome, 9-13 October 2017). CFS is the foremost inclusive platform for all stakeholders to work together to ensure food security and nutrition for all. As well as the official #CFS44 session, “CFS week” also includes a wide range of side events on a variety of themes as well as other activities. As last year, we aim to train up a stellar onsite social media team, combining experienced social media experts, professional communicators, and novices. While we build up the team’s social media skills, we want to use the momentum to significantly increase the online outreach of #CFS44 to involve the offsite public. 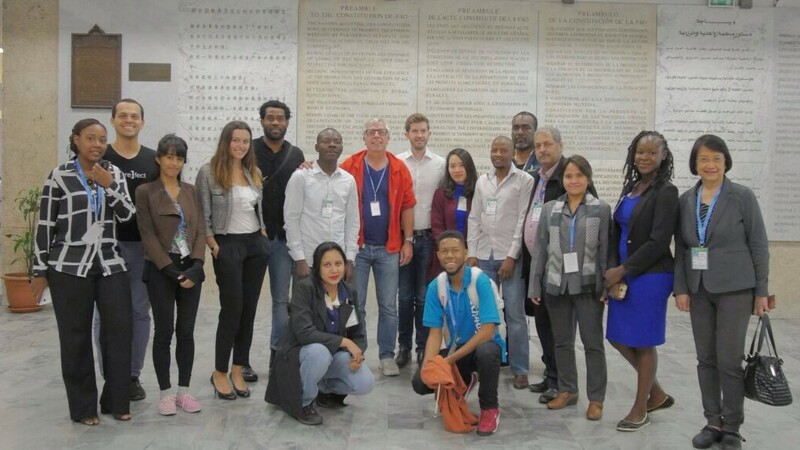 To do this, we will provide a two-day “boot camp” training to 29 social reporters—12 fully sponsored by GFAR—followed by five days of live social reporting from the #CFS44 event, during which they will be let loose to write blog posts about the issues they encounter in the plenary and side events. This year, however, we wanted to bring even more value to the exercise. By leveraging GFAR’s vast networks of partners, we aim to ensure that the trainees bring messages back to their organizations and networks that will allow for awareness raising on relevant CFS policy recommendations, and ground-truthing of the relevance and potential uptake of these policies. In short, we’d like to help CFS see where the decisions made in the plenary discussions translate into policies at the national level and action on the ground. This is very much in alignment with GFAR’s goals, as the issues to be addressed at #CFS44 (forests, urban transition, nutrition, women’s issues, etc.) are relevant ones under our current and future work plan. The 12 social reporters sponsored by GFAR were therefore chosen from among Partners in GFAR. They are fully committed to using their best efforts and skills to work within a well-motivated and active social reporting team, and to lay the ground for further evaluation of the CFS recommendations/guidelines when they return back to their home organizations. Stay tuned to the CFS Blog and GFAR Blog for a plethora of interesting and exciting blog posts all about food, nutrition and many other related issues! And be sure to follow #CFS44, @UN_CFS and @GFARforum.